There is always going to be an element of anticipation when it comes to a new Star Wars movie. It’s also one of the most divisive series around because the fans will want one thing while the regular cinema goer will want another. It’s a hard balancing act to get right. After the debacle of the prequels, the series was given a well-needed boost by J.J. Abrams’ next chapter, The Force Awakens, which on reflection was a retread of the original 1977 film. Now Looper director and writer Rian Johnson have taken over the reins to deliver The Last Jedi. Does it disappoint? Absolutely not. With the Resistance still under attack from the First Order, Rey has been sent to find the Jedi master, Luke Skywalker, in order to bring him back so he can help the battle. Yet a reclusive Skywalker wants nothing to do with the Force anymore and once he realises that Rey has it but doesn’t understand how to use it, he shuts himself off even more. Meanwhile, the Resistance, with its small band, need to find a safe home but when they find out that there is no escape from The First Order, they have to bide their time, in the hope that Rey can come through before they are destroyed. I am being very careful not to give a spoiler-filled review here, as there are so many twists and turns within the plot and with the different characters that it would ruin the fun of the film and upset many fans. This is the longest of the series so far and you can see why. It is rich in details and subplots that each strand has to be careful played out in order for the emotions and situations to really work. At 2 and a half hours, it never feels too long, although it does have some moments which you think either could have been trimmed or removed altogether. Johnson, given an open canvas to work from, has carried on directly after The Force Awakens, the first time this has happened in a Star Wars movie, carefully crafting the story so the loose ends in the first film are explained while teasing us to look forward to the third film, due out in two years time and under the direction, once again, of J.J. Abrams. This is a film more about character development than about plot. Johnson hasn’t just replayed the beats of a previous Star Wars movie, although there are nuggets of past successes to keep the true fans happy, instead, he seems more interested in where these characters are going and how they deal with who they are and why they are there. in doing so, he has made a film which isn’t just another space opera relying just on special effects and huge set pieces. You watch the emotional and mental conflict of each individual which leads them to do the things they do. Luke Skywalker, for example, isn’t the same man he was when we left him in Return of the Jedi. He has changed and yet that change is fully realised. Kylo Ren is no longer just an evil entity but a man battling with his conscience after his actions in The Force Awakens. 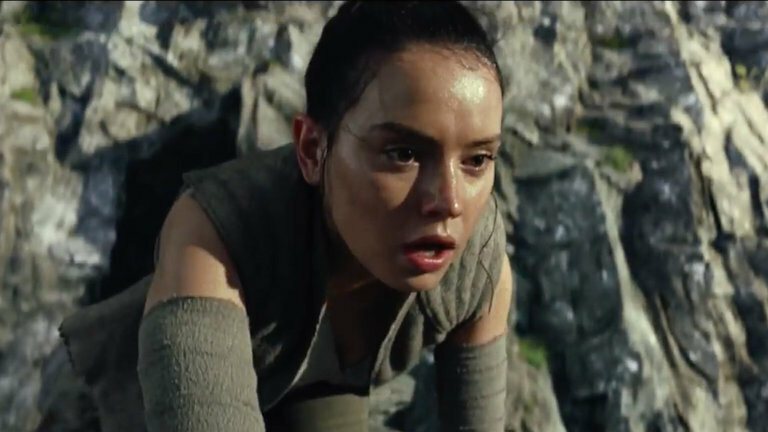 Rey is no longer just a scavenger who has somehow found herself in the middle of a civil war but a young woman with unexplained powers that could lead her to make the wrong decisions. All these elements are beautifully woven into a plot that, if you were, to sum up in the most basic form, is a chase in space. Yet that would be an insult to the complexities of the subplots and conflicts that push this film along. There are the odd moments that, for me, didn’t work. 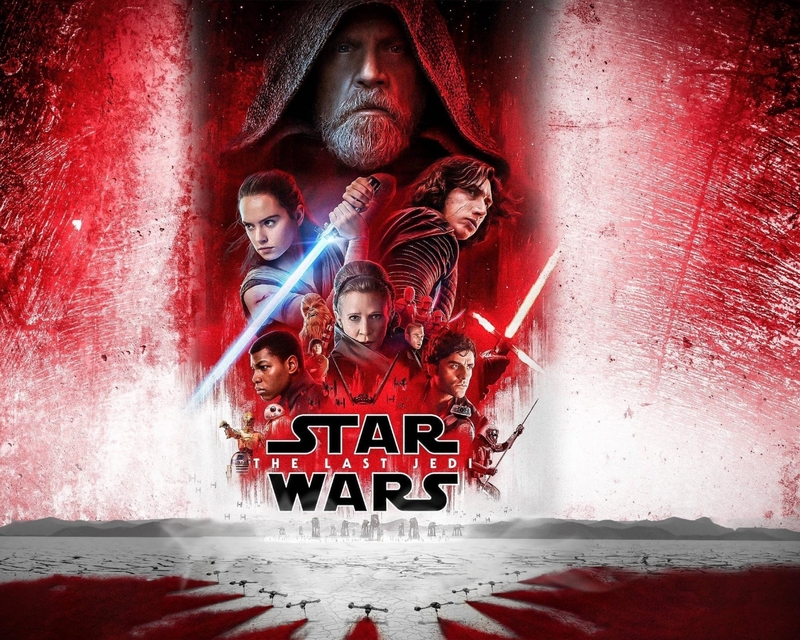 One, which occurs about halfway through the film, almost lost me completely and yet I was glad it didn’t, for the final 45 minutes are, quite possibly the most nail-biting and emotionally draining yet in any Star Wars film. There are moments of pure tension, moments of pure wonderment and moments where the tear-duct opened. It’s also very funny, with some nicely placed moments of comedy and the scene-stealing porgs, a Pokemon-looking bird that will have you won over by their cuteness and belly laughing at the slapstick. The performances are outstanding. Mark Hamill is the best he has ever been as the tormented Luke and has taken him to another level. Adam Driver has created a human villain who isn’t interested in just blowing things up, but is having to deal with demons in his life and decisions that he may regret. Daisy Ridley has become the perfect role model for all female characters; tough, resilient while still having elements of a woman confused by her position in the universe. John Bogeya’s Finn has found a delicious mixture of comic and dramatic, while Oscar Isaac’s Poe has become a man refusing to stand down. However, this film belongs to Carrie Fisher. Having tragically passed away just after filming, this is a fitting tribute to an actress who made a female character such an icon. This is, without a doubt, her finest hour and even if you aren’t emotionally involved in the story or characters of this film, you will surely shed a tear for the loss of Miss Fisher. The Last Jedi does have its flaws and will probably annoy the die-hard fans but as a piece of blockbuster entertainment, it ticks all the right boxes while still keeping the integrity of the original series. Like The Force Awakens, returning to this world is like meeting up with an old friend. It makes you feel safe while showing the wonders of what you can do when you have a director who doesn’t treat its audience like children but delivers something intelligent and magical. The Last Jedi is a hit and a perfect second act to what, I hope will be an amazing trilogy. It’s certainly looking that way.